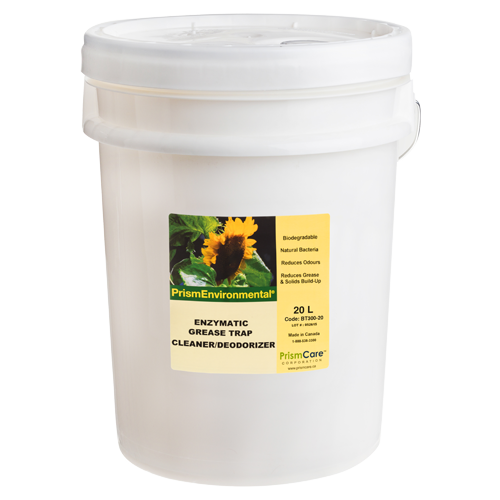 PrismEnvironmental® Enzymatic Grease Trap Cleaner & Deodorizer is an environmentally responsible, concentrated bacterial product. It digests grease and eliminates malodours the natural way! Billions of colony-forming bacterial spores are released into the source and release enzymes which then feed specifically on grease. As they feed, they multiply exponentially to form more bacteria that digest more grease. This process continues until all the grease is consumed, thereby eliminating foul odours, blockages, and the need for costly maintenance services. Digests organic matter such as fats, carbohydrates, proteins, cellulose, etc.